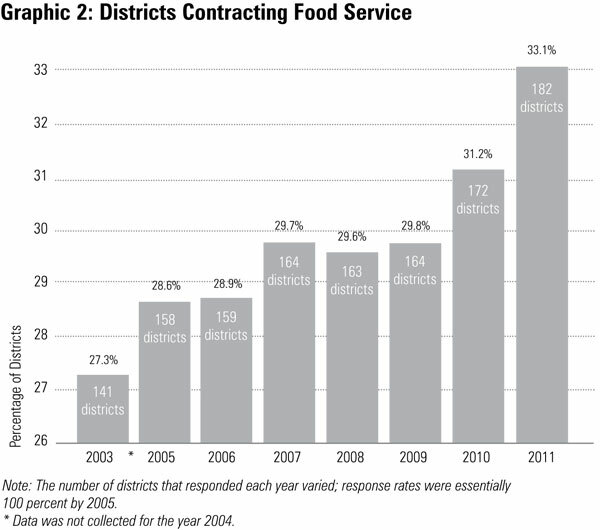 33.1 percent of districts (182 out of 550) contract for food services. Three districts began contracting out food service this year. Of the 13 new food service contracts, seven were for employees leased through private vendors instead of turning over management of the service to a private firm monitored by district administrators. This often provides savings to districts because leased employees are not participants in the state’s pension fund, which requires large contributions from both employers and employees. Currently employers must contribute 23.2 percent of a new employee’s pay and employees are required to contribute up to 6.4 percent of their wages, depending on their annual wages, to the system. Private employers typically offer 401(k) benefits that cost employers around 5 percent to 7 percent of an employee’s pay and employees are not mandated to contribute. The other six contracts included management of a district’s food services with private vendors. While districts reported savings, few were able to provide bid sheets or other documents that listed expected savings from the move. Richmond Community Schools was in need of a new food manager for the 2010-2011 school year following a retirement, and developed a plan to rehire a previous food manager through a contract with PCMI. The contract resulted in savings of $30,000 for the year through a decrease in base pay and through offering less expensive retirement benefits. Kingsley Area Schools hired a private manager from Chartwells to supervise its food services, which had been running at a substantial deficit. The district reports roughly $30,000 savings and satisfaction with the service quality. According to the district’s budget, these savings enabled Kingsley to shore up their food service fund balance while continuing a building improvement initiative. Sodus Township District #5, a single-school district in Berrien County, just began offering food services for the first time. The district contracted with JA Food Service to provide lunches for its students. No savings estimate is applicable given the lack of any previous in-house service, but the school’s principal reports being satisfied by the arrangement. The Lamphere Schools, in Oakland County, began contracting in the 2009-2010 year for custodial workers through PCMI. In 2010-2011, it expanded contracting to include cafeteria staff as well. Each new hire through PCMI saves the district between 15 percent and 40 percent on the staff position contracted. Morley Stanwood Community Schools contracted out its food service to Chartwells to seek greater efficiency, rather than savings. It expected minimal savings, but the district reports increased student participation in school lunch and breakfast programs and satisfaction with an increase in the menu options available to students. Ashley Community Schools broke even this year on a new food service contract with Chartwells, as transitional costs offset the district’s decreased regular expenses. The district reports satisfaction with the quality of service, and expects savings in future years.